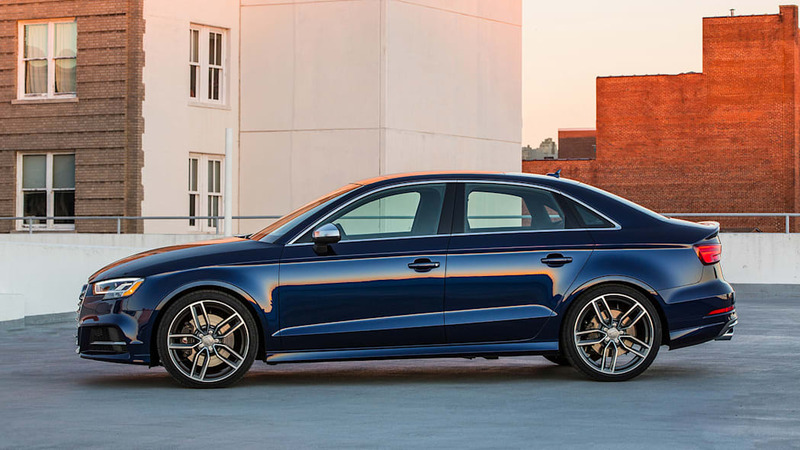 The 2017 Audi S3 is a car without equal. That might end up on a billboard, but it's actually meant quite literally, as in the S3 has no direct competitor. 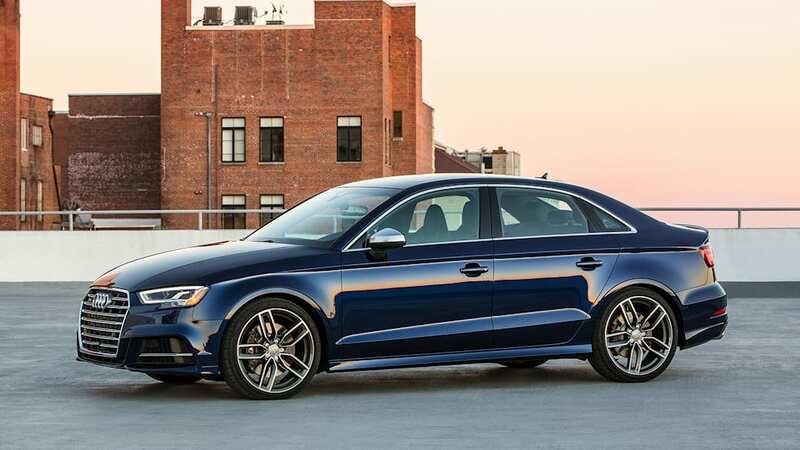 Other compact luxury sedans, of which there are few, can't match its performance. The BMW 2 Series has two doors, plus it's rear-drive. The bonkers Mercedes-AMG CLA45 is on another power and price planet altogether. The mechanically related VW Golf R isn't a luxury car and has a hatch instead of a trunk. And so the S3 exists as an oddity. But it's a fun oddity, and a well-made one too. For 2017, it receives a number of noteworthy changes to keep it fresh and technologically relevant. 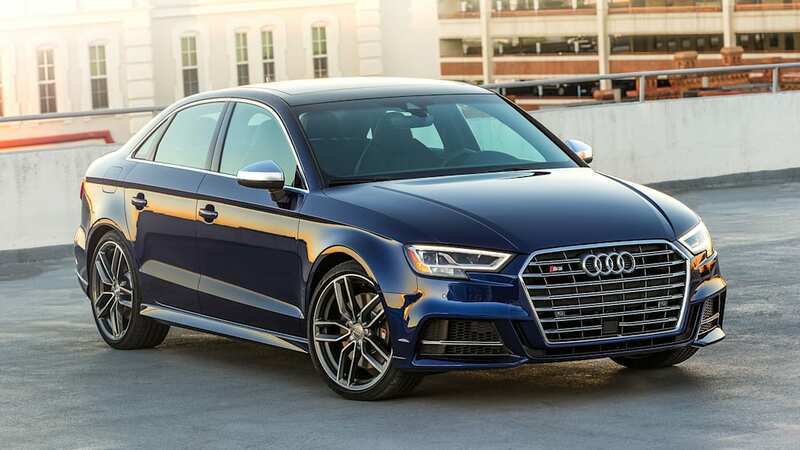 Most also apply to the 2017 Audi A3, the car on which it's based, which itself gets a new 2.0-liter turbo four base engine in place of the old 1.8-liter. 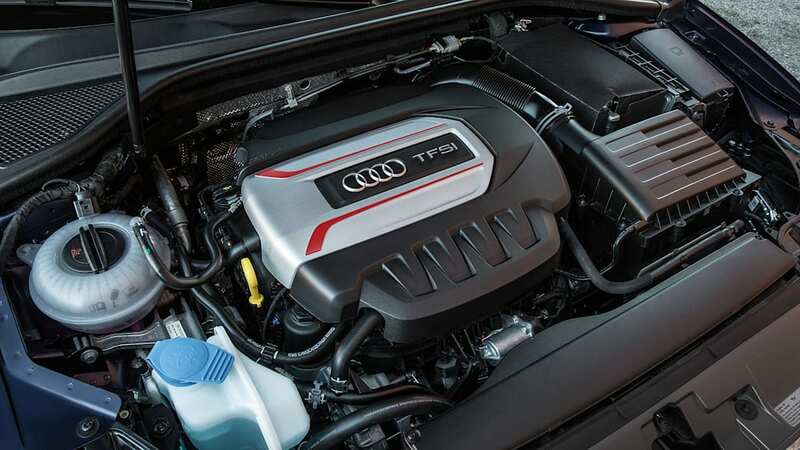 Paired with front-wheel drive and essentially a variation of the Quattro model's carry-over 2.0-liter, it produces 186 horsepower (up from 170) and returns 29 mpg combined (up from 27). 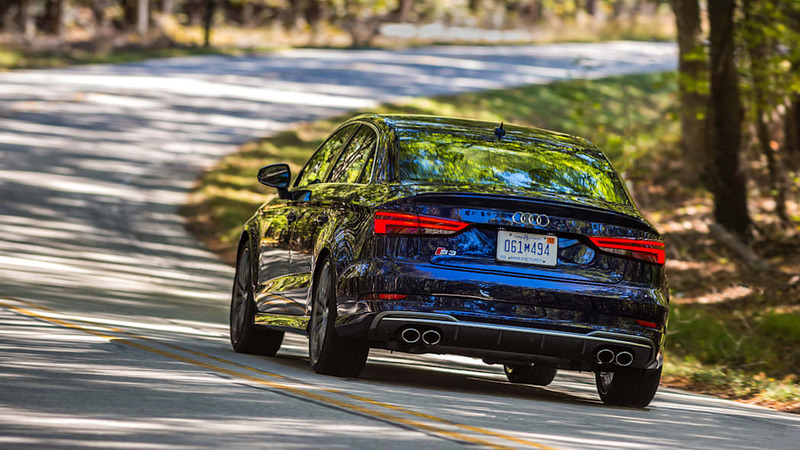 That revamped A3 wasn't on hand for the press drive in Durham, North Carolina, so we were not-at-all stuck with the 2017 S3. 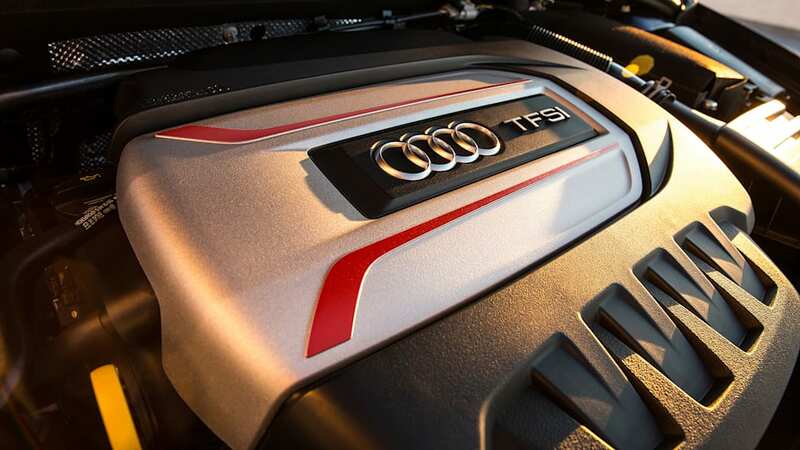 Its own 2.0-liter turbo four is unchanged, still pumping out 292 hp and 280 pound-feet of torque through a six-speed DSG dual-clutch automatic transmission. 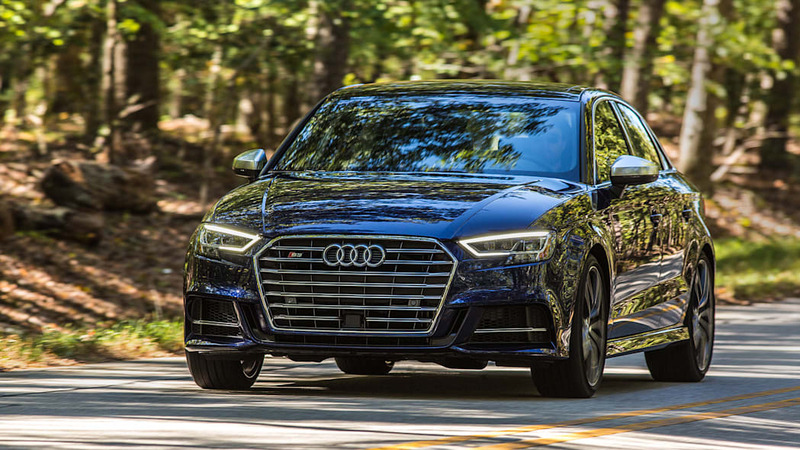 Audi says it'll hit 60 mph in 4.7 seconds, which is a full second quicker than the 220-hp A3 Quattro as well as about a half-second quicker than the Audi A4 Quattro. That bonkers CLA45 is around the four-second mark. Indeed, having so much power in such a small sedan is a novel and grin-inducing experience. 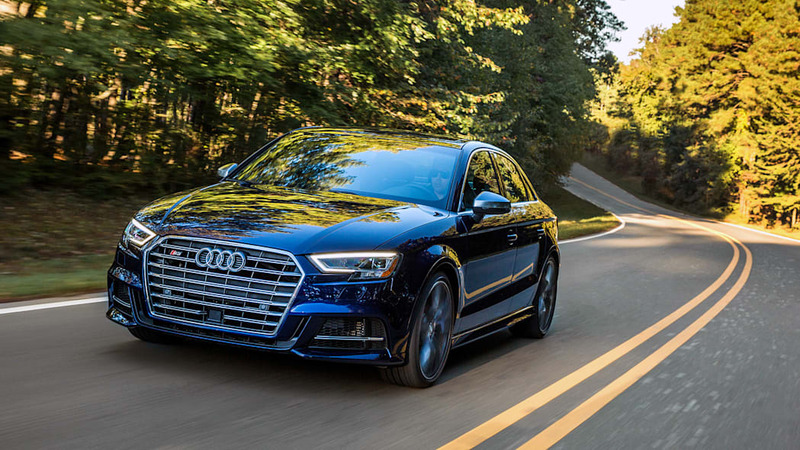 The throttle response is sharp enough in standard mode, but tap the dash-mounted Audi Drive Select toggle to choose Dynamic, and it comes even more alive, eagerly shooting the S3 forward with the merest hint of a toe wiggle. The DSG is also quite happy to downshift when called upon, either by said toe or by itself when under braking. 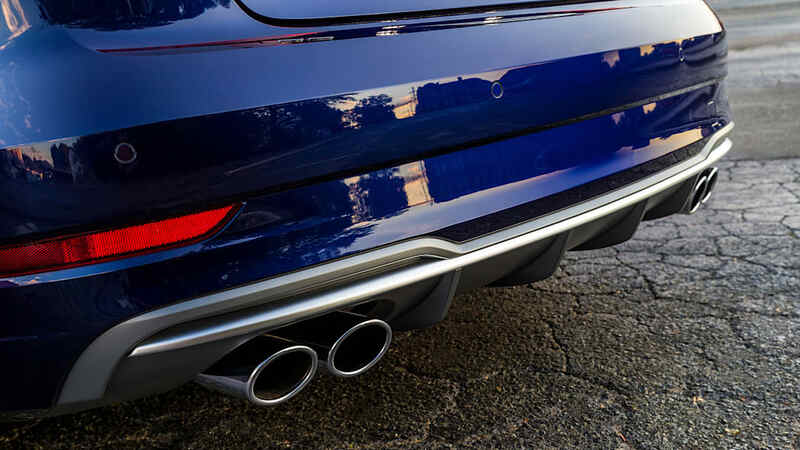 Blipping down two gears when heading into a corner is commonplace here, as are the sharp little barks that emanate from the S3's quad exhaust tips. 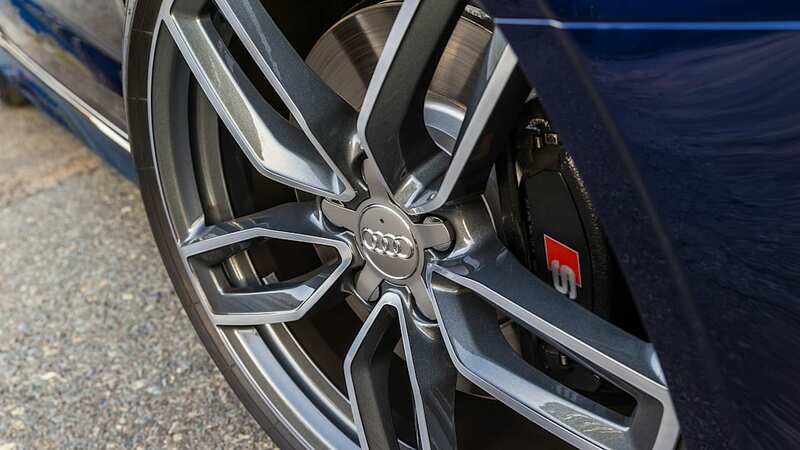 And then there's the S3's Quattro all-wheel drive, which has been updated for 2017 with the same performance-oriented system found in the TT and TTS. Although its front/rear torque split is constantly changing based on current traction conditions, it nevertheless skews towards a rear torque bias to the point that, when in Dynamic mode, it won't reduce power in oversteer situations. A Ford Focus RS Drift Mode it is not, but it nevertheless provides more of a rear-out feel than you'd expect from an all-wheel-drive car with a front-drive architecture. As usual, though, Audi steering doesn't impart enough feedback. Much like the new A4, the S3's corner-taking abilities and the speed at which you can hustle it along are impressive, but regardless of the Drive Select setting, there's a layer of isolation present that makes it difficult to become fully engaged in the driving experience. Included on our test car was the $1,500 Dynamic package and its magnetic adaptive suspension. 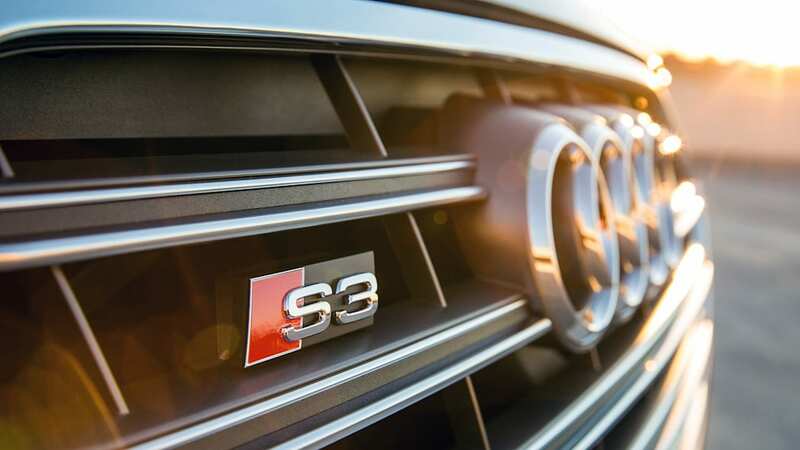 You can feel the difference between its added Drive Select modes, but know that regardless of your selection, the S3 resides on the firm side of the ride comfort spectrum. It feels jittery at times, particularly in the 45–55-mph range, and it may get a bit tiresome on longer journeys. We wager that the standard, non-adjustable suspension would be worse in this respect so, in theory, this package is money well spent – especially given the handling benefits it most certainly also affords. 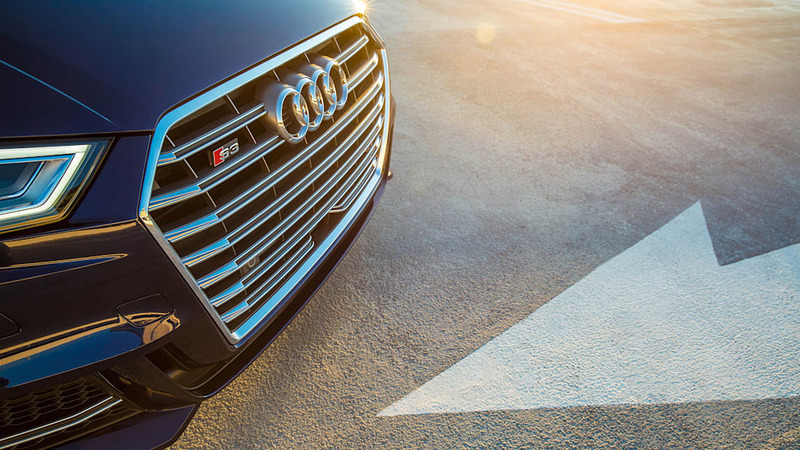 Visually, the 2017 S3 gets the new, more angular Audi grille shared with the A4, TT, Q7, et.al., as well as a small indentation in the opening's lower half that houses sensors for the forward-collision warning and auto-brake system now standard on every A3 and S3. 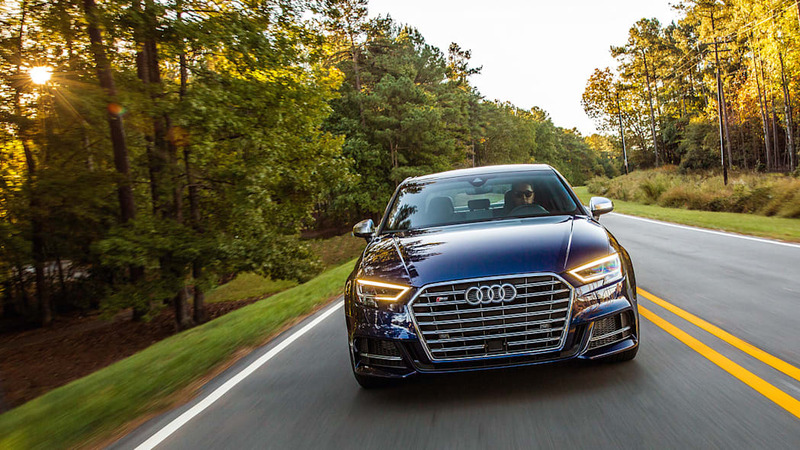 The headlight cluster now possesses the same kink as the A4's, as well as standard LEDs (xenons are standard on the A3), and integrated fog lamps. The larger corner air dams and the scooped-out portion below the grille are new as well. 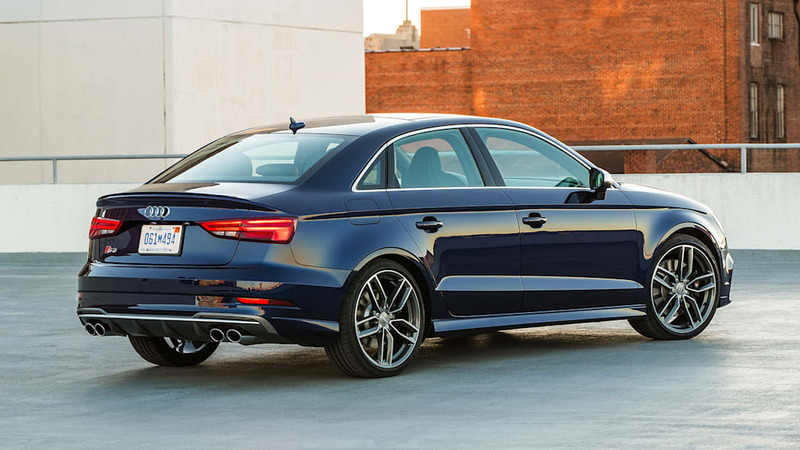 Around back, both the A3 and S3 feature a more prominent lower valance finished in gray, though the S3's features a diffuser and an extra pair of exhausts. 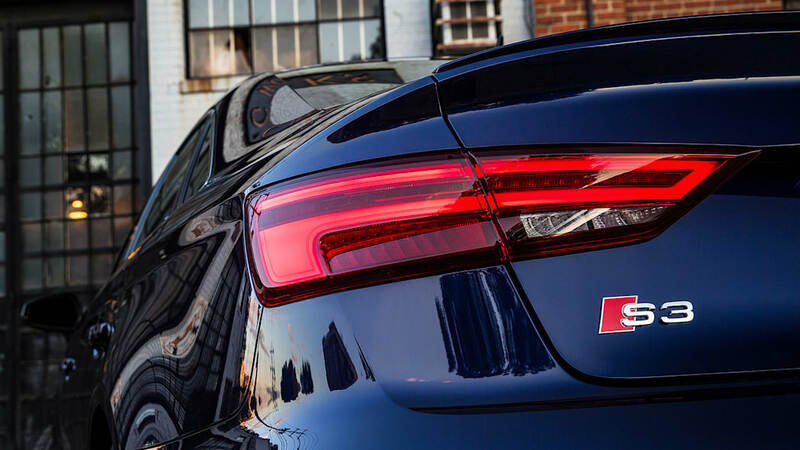 The LED taillight cluster has also been redesigned, and like the A4's, it features a brake light strip that pulses outward in the direction you're turning. It's cool, albeit in a '64 Thunderbird kinda way. Much like the exterior, the interior's hardware has been updated to keep up with the new Audi norm. There are now two USB ports that provide both charging and a data connection with a smartphone – the A3 and S3 previously had a charge-only USB port and a proprietary connector to handle both charging and data. 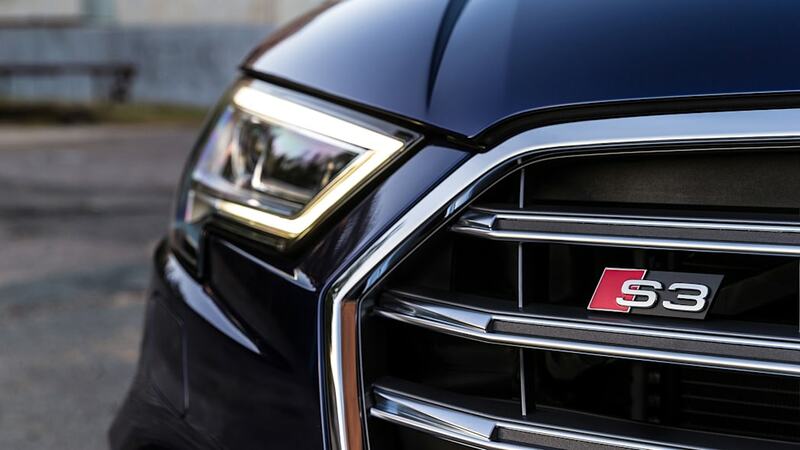 We happily welcome Audi to this decade. 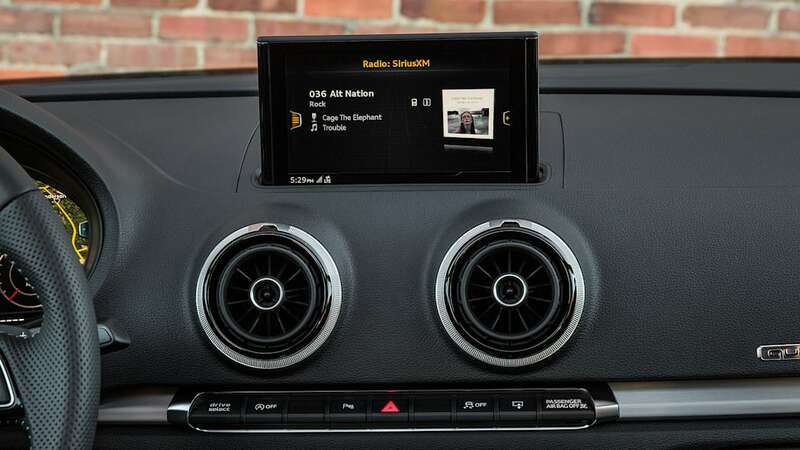 A less overdue addition is the S3's standard Apple CarPlay and Android Auto functionality. 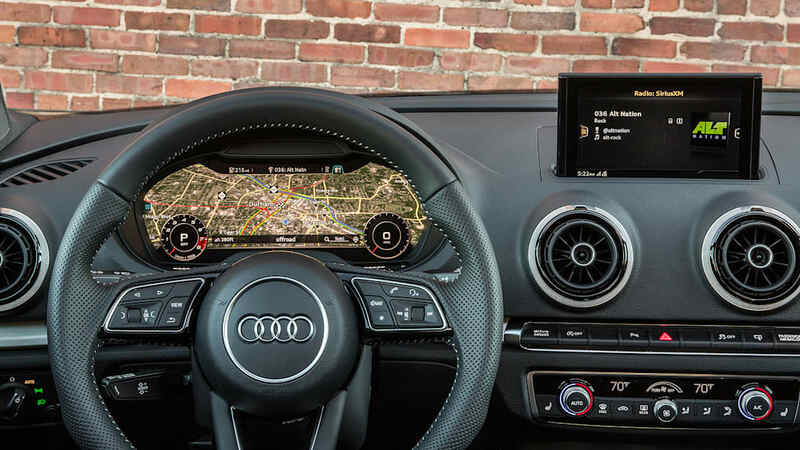 The big tech addition, however, is the Audi Virtual Cockpit setup included in the $3,000 Technology package. 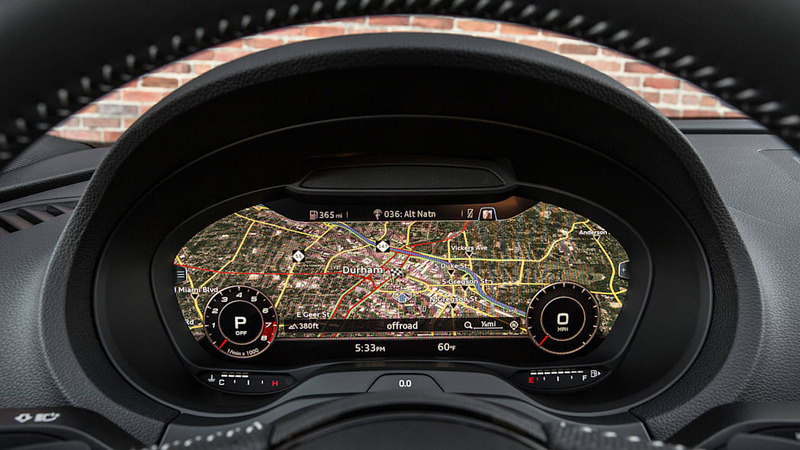 We detailed the tech in a TT as a nominee for our 2016 Technology of the Year awards, but unlike its initial applications in the TT and R8 sports cars, Virtual Cockpit now includes a center display to go along with the massive gauge screen aimed at the driver. 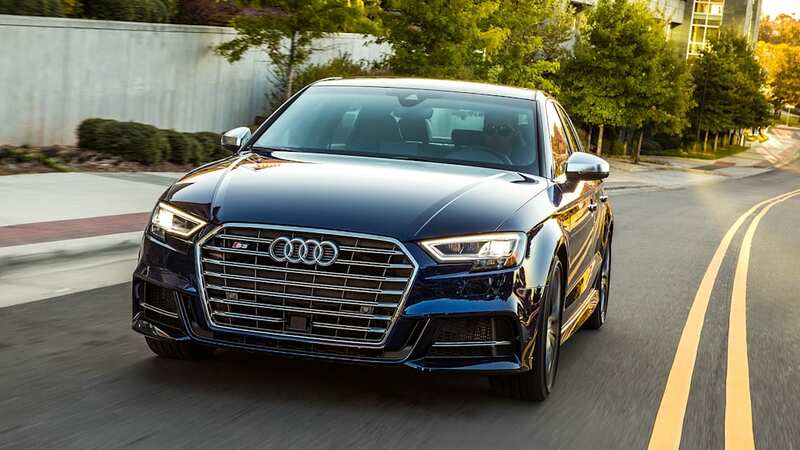 Because it's an S car, the S3 gets an additional layout beyond the "Classic" layout found in the A3 that essentially mimics the standard gauge cluster. 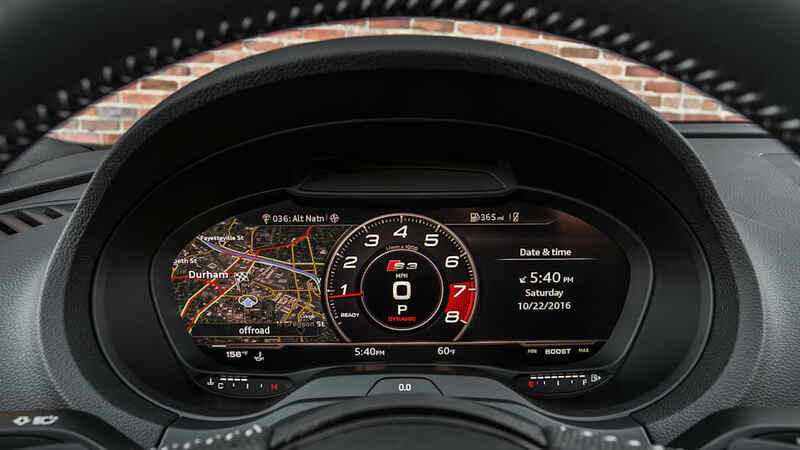 The special "Sport" layout features a prominent central tachometer with an inset digital speedometer and trip/audio/phone/navigation information flanking it on either side. With either layout, that secondary information can be toggled to take over the majority of the screen. To accommodate Virtual Cockpit, as well as the latest MMI menu structure, every A3 and S3 features new left/right menu buttons bookending the spoke-mounted thumb wheel and center console MMI knob. 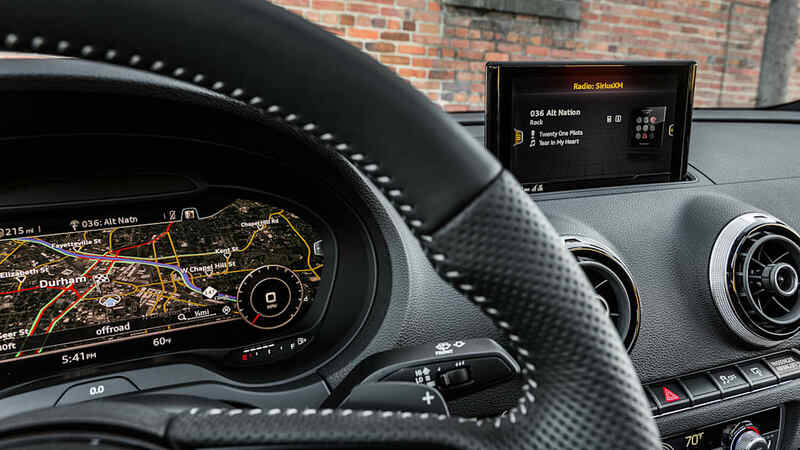 The latter continues to operate the pop-up dash-mounted screen that's present regardless of whether the car has Virtual Cockpit. 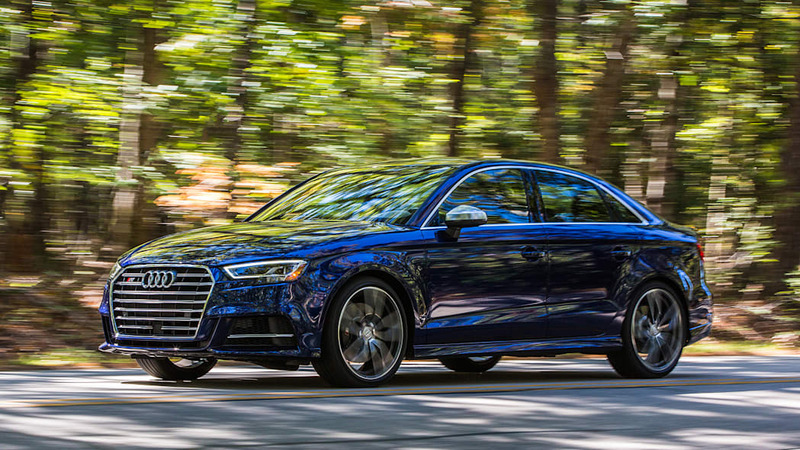 Otherwise, the A3/S3 cabin remains proof that a small car doesn't have to be a chintzy car. 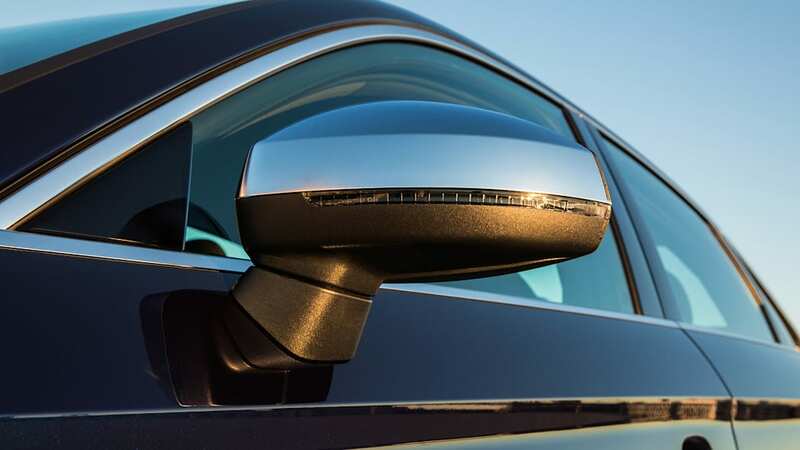 The materials and construction are superb, and you'll never get tired of the reassuring "clicks" that go along with every turn of a knob or ultra-cool air vent. The minimalist design itself is refreshingly different from that of the A4, although there are those who think it can look too simple, especially when the center screen is tucked away. 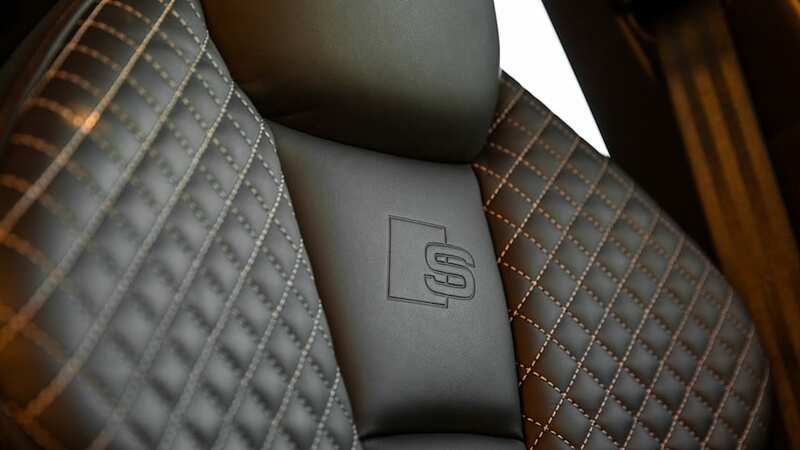 Our test car also came equipped with the $1,450 S Sport seats that look super swank with their prominent shoulder bolsters covered in quilted black leather. Okay, so they look a bit like a cobra head or the top of King Tut's sarcophagus, but they're incredibly comfy and supportive. They're also, rather distinctly, 10-way manually adjustable. The mechanism for the S3's standard power-operated seats raises them, and thus your noggin, closer to the roof. So unless you frequently share driving duties, the lower S Sports are worth the extra cash. 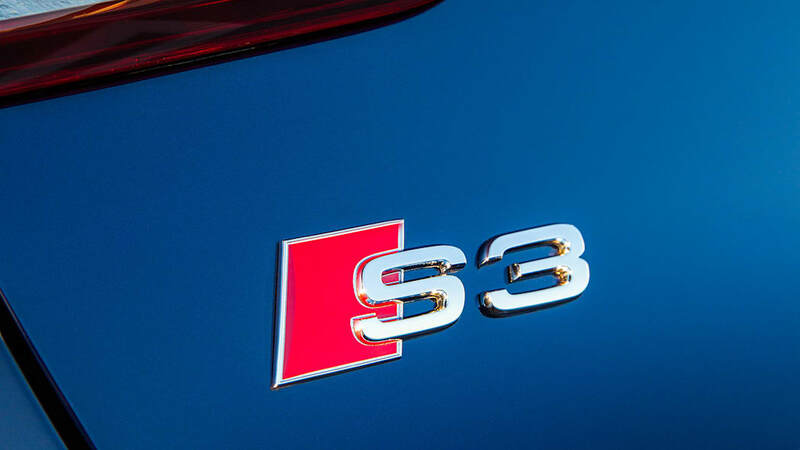 Deciding whether or not the 2017 S3 itself is it worth the extra cash is a tough one. 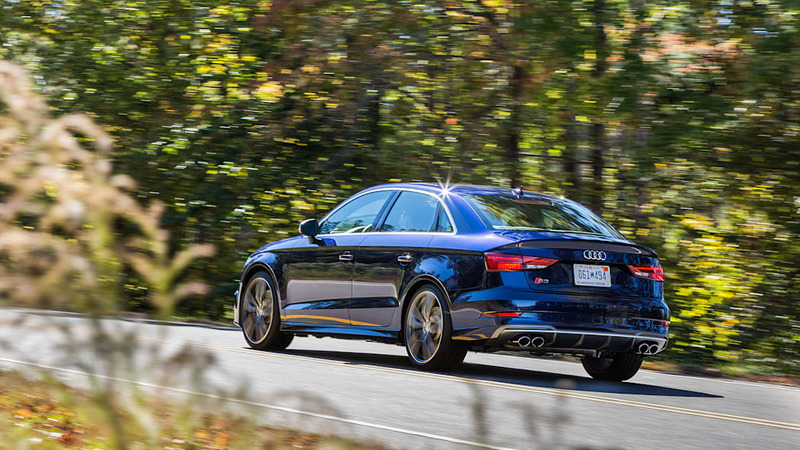 The sportiest version of the 220-hp A3 2.0T Quattro is about $44,000 – the similarly loaded S3 we drove is $51,325. Meanwhile, the 2017 Volkswagen Golf R, which shares its 292-hp engine with the S3, comes within a few hundred bucks of the hot Audi's $42,900 base price. 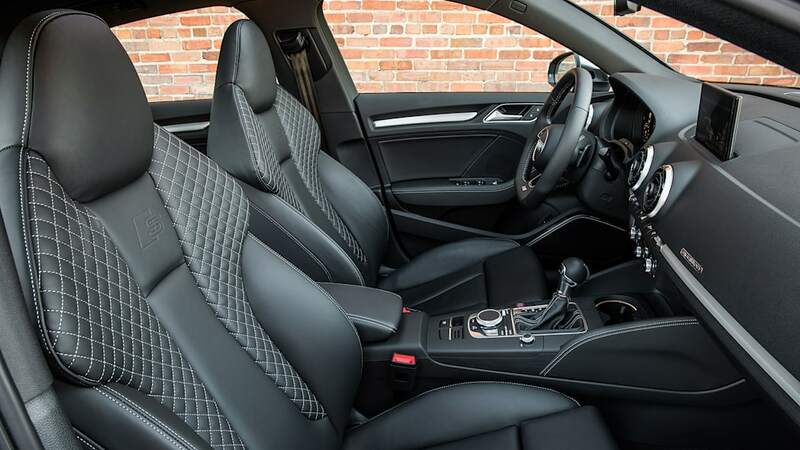 The VW actually boasts more standard features, but their optional Audi counterparts are ultimately better executed (particularly on the tech front) and there's no denying the superiority of the S3's cabin. Then again, you could think of it this way: A similarly equipped A4 would also cost around $51,000. 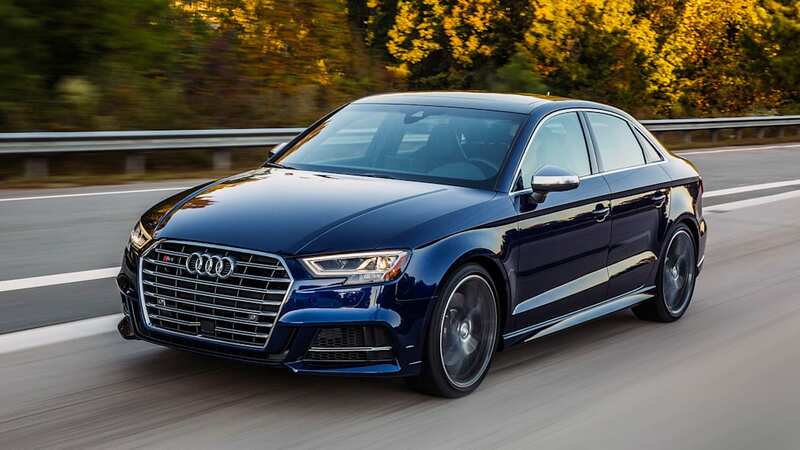 It offers a comfier ride and more space (the A3/S3's back seat legroom and trunk remain cramped), but it has less power and isn't as sharp to drive, and we can't say it provides a significantly superior interior. Plus, thanks to the S3's visual updates, they even look alike. 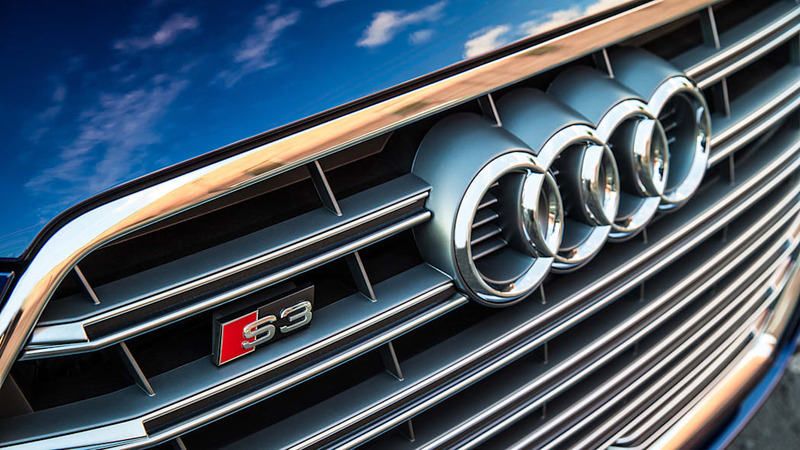 Which brings us right back where we started: The S3 has no equal. Maybe that's a good thing, maybe it's inconsequential, maybe we should just be glad that such a fun, handsome, and luxurious little car exists for whoever chooses to bring one home.